Meresamun being prepared to be scanned. The work was done by scientists at the University of Chicago using CT (Computed Tomography) scans. These combine X-rays with advanced computer processing technology to create accurate detailed images of the body’s internal structures and organs. The Philips 256-slice Brilliance iCT scanner works at very high speeds. In the living this means it can produce a full body scan in under a minute and accurately capture moving organs, including the entire heart in just two beats. 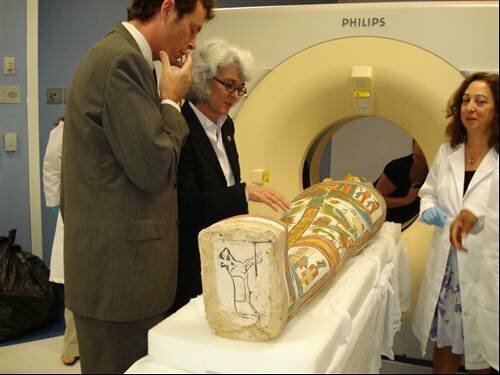 Meresamun is the only mummy to have been scanned on such an advanced CT scanner. Scientists have used an advanced scanner to get never-before-seen images of a 3000-year-old mummy. Staff at the University of Chicago combined X-rays with advanced computer processing technology to create the images.